We had popped in for an after work drink but when I heard a new pigeon dish was on the menu, we just had to stay for dinner! I have the Corn Soup with crab and chorizo fritelli on white bean puree - you can really see it but the soup is the colour of sunshine and would easily be the best corn soup I've tasted. 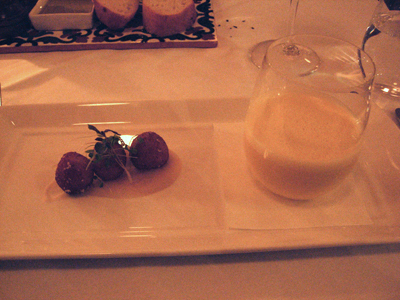 Sweet and creamy it tasted like pure corn. 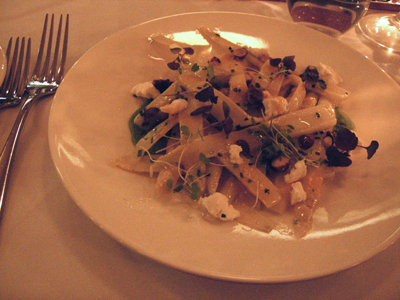 Paalo has the White Asparagus and Goat Cheese Salad - the thick spears of white asparagus have been evenly sliced lengthways and grilled. 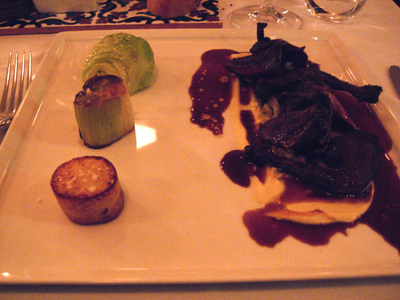 I have the corn fed Glenloth pigeon roasted with bay leaf and red wine, served with cabbage, leek and potato. It definately was the right decision to stay to have this dish - a beautiful pigeon cooked perfectly, the breast tender and pink. 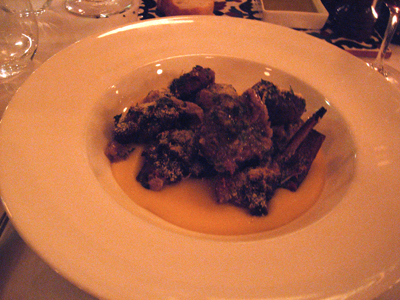 Paalo has the Abbacchio alla Romana, wet roasted Meredith Lamb with soft polenta - the perfect dish for the cooler weather.